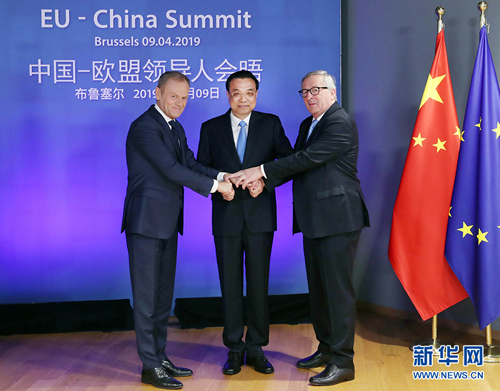 On the afternoon of April 9, 2019 local time, Premier Li Keqiang co-chaired the 21st China-European Union (EU) Leaders' Meeting with President of the European Council Donald Tusk and President of the European Commission Jean-Claude Juncker at the headquarters of the European Council in Brussels. Speaking positively of the progress of China-EU relations in various fields, the two sides agreed that China and the EU share extensive common interests in deepening practical cooperation featuring mutual benefit and win-win results, share common ground on upholding multilateralism and an open world economy as well as opposing protectionism and unilateralism, and have common goals in improving global governance and maintaining world peace and stability. It is quite necessary for China and the EU, two major stabilizing forces and two major economies in the world, to carry out strategic communication and cooperation. The two sides should firmly grasp the mainstream of cooperation, and properly deal with differences and frictions through dialogue and consultation, so as to push China-EU relations for long-term, stable and sound development. This is in line with the fundamental and long-term interests of both sides, and will also exert important and positive influence on the world. Both sides reiterated their commitment to deepening China-EU partnership featuring peace, growth, reform and civilization, and will advance the formulation of a new agenda for cooperation beyond 2020. The two sides promised to support multilateralism, respect the basic norms of international law and relations with the United Nations at the core, firmly support the rules-based multilateral trading system with the World Trade Organization (WTO) at the core, and strengthen dialogue and cooperation on issues concerning the WTO reform. The two sides promised to offer each other broader, more facilitated, and non-discriminatory market access, and promote the negotiations on a China-EU investment agreement to achieve decisive progress required for the completion of the negotiations in 2019, so as to reach a high-level agreement in 2020. Both sides agreed to enhance cooperation in scientific research and innovation, and confirmed their intention to renew the China-EU Science and Technology Cooperation Agreement. Both sides welcomed the provisional agreement reached on the negotiations of the China-EU agreement on geographical indications, and committed to formally concluding the negotiations by the end of this year. Important consensus has also been reached on government procurement, and the zoning principle of bilateral trade in agricultural products. Both sides agreed to continuously promote the integration between the Belt and Road Initiative and the EU strategy on Connecting Europe and Asia, enhance cooperation within the framework of the China-EU Connectivity Platform and jointly improve the sustainability and interoperability of Europe-Asia connectivity. Both sides will strengthen cooperation in such areas as climate change and clean energy, and implement the Paris Agreement. Both sides supported peaceful settlement of existing regional disputes and conflicts through dialogue and consultation, so as to jointly promote world peace, prosperity and sustainable development. Li Keqiang said that President Xi Jinping paid successful visits to Italy, Monaco and France not long ago, injecting new impetus into the China-EU comprehensive strategic partnership. China has always attached great importance to Europe, supported the European integration chosen by the EU member states, and firmly remained committed to deepening the comprehensive strategic partnership featuring mutual benefit and win-win outcomes with the EU. China and the EU will create opportunities for each other while pursuing opening up, and will bring prosperity to the whole world while striving for cooperation. China is ready to work with the EU side to elevate bilateral relations to a higher level. Li Keqiang briefed Donald Tusk and Jean-Claude Juncker on the forthcoming 8th Summit between China and Central and Eastern European Countries in Croatia. He pointed out that the 16+1 cooperation is between China and a sub-region of Europe, adding that it is conducive to reducing the development gap among European countries and facilitating the European integration. The 16+1 cooperation complies with established international rules as well as EU laws and regulations, follows the business-led principle and market-based operation, pushes forward joint projects for win-win results and will inject new impetus into cooperation between China and the EU. Donald Tusk and Jean-Claude Juncker expressed that in the complicated and changing international situation, the EU side is ready to enhance relations and cooperation with China. The EU side highly values the series of important consensus reached between the two sides during the meeting. Both sides will release a joint statement, which is an achievement of mutual benefit and win-win outcomes, and demonstrates new and positive development of China-EU relations. The EU side will implement the consensus along with the Chinese side to well implement the consensus and push bilateral relations for more results. The two sides also exchanged in-depth views on international and regional issues of common concern. After the meeting, Li Keqiang, Donald Tusk and Jean-Claude Juncker jointly witnessed the signing of several cooperation documents between China and the EU in such areas as energy and competition. Wang Yi and He Lifeng attended above activities.